With the exception of one brief era, all human communications can be characterised as social media. Epic poetry, fireside storytelling and conversations have dominated our collective history. 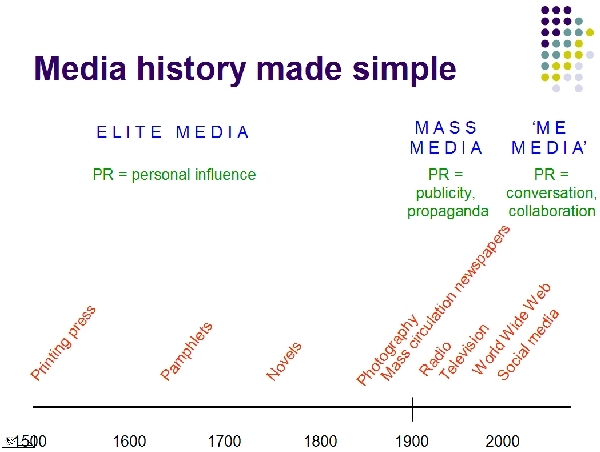 The exceptional era has been the industrial age, which introduced mass media (large circulation newspapers and broadcasting). We're now emerging into a post-industrial age in which mass media sits alongside new forms of web-enabled social media. So to suggest that public relations is returning to a more conversational style involving community building and storytelling is not to predict something new, but rather to describe a return to something more traditional. This was one of our discussion points from a guest lecture I gave for London Metropolitan University PR students yesterday. That’s refreshing to read: Two-way-communication is not an invention from the industrial age. The emergence of mass media, advertising and public pelations have rather suppressed conversational style than fostered. Luckily it does not depend on the the decision of organisations and mass media anymore whether a public debate is launched in the web-sphere. A truely revival of Marxist ideas: The media as capital to control the masses is now owned by individuals and grass-root groups, too. Do we talk about soical media or media-socialism? The role of new media cannot be ignored and the group activity on the internet space are doing wonders for many of us, both personally and also professionally.Its now more informal, conversational and very individualistic in its whole sense of communicating with others. It has totally changed the perception of what it used to be and what it has become! Everything is cyclical. You’ll always have a need for traditional approaches to journalism and PR, the trick is knowing how to apply across traditional and emerging communication channels.